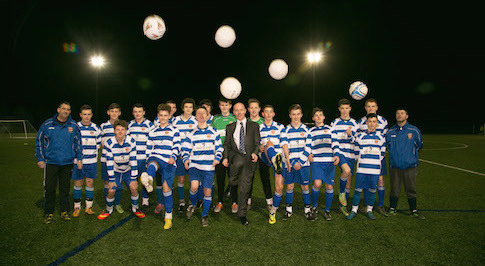 Bristol Street Motors Preparation Centre in Darlington is lending its support to Chester le Street under 16's football team. The sponsorship has enabled the team to purchase a new home kit and helps make it possible for the boys to continue enjoying their football without a large financial burden on parents. Chester le Street Town Youth Football Club is based at Riverside and Hermitage Academy in Chester le Street. The club currently has 18 teams aged from under 7's to under 18's, all competing in the Russell Foster Youth League. Bristol Street Motors operates dealerships across the area including Darlington, Durham, Newcastle, Sunderland and Peterlee. "Bristol Street Motors has a proud tradition of supporting local community causes and this has been continued with our sponsorship of this youth football team. "I think it is very important to be engaged in the local community, especially in an area where we have a presence. Helping to give young people opportunities is something we value and we are delighted to support the Chester-le-Street Town under 16s team and hope they have a great season." Team manager Greig Garrity said: "It's so important that local businesses lend their support to the Club to enable us to continue running and enabling many young people to play football in an organised way. "We are grateful to our sponsors and the lads are proudly wearing their new shirts."